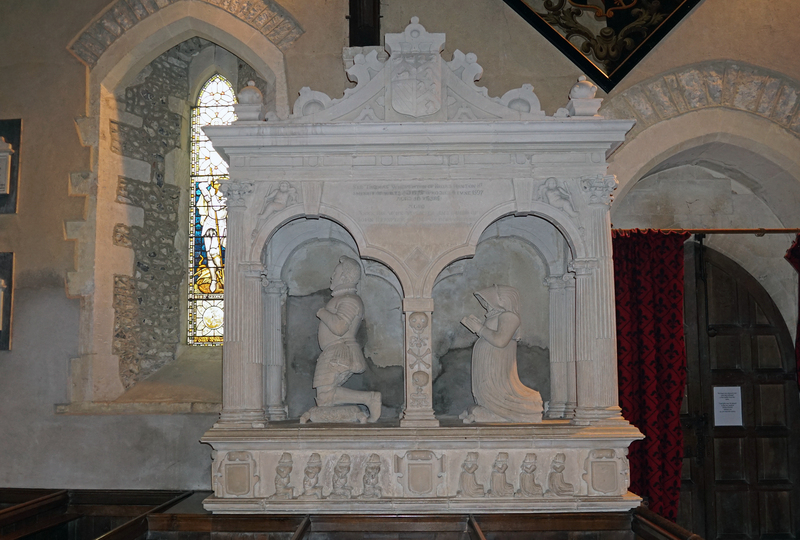 Church of St Peter Ad Vincula, Broad Hinton, Wiltshire - Photo "Sir Thomas Wroughton monument 1597, Church of St Peter ad Vincula"
Legend says Sir Thomas returned from hunting to find his wife Anne reading the Bible instead of cooking his supper. He flung the Bible in the fire but she retrieved it badly burning her hands. Because of his blasphemous behaviour, Sir Thomas's hands withered away too, as did those of his children. The monument shows Anne holding a partly burned Bible and Sir Thomas has no hands.